Ritchey Megabite 38c Cross Tire features an aggressive tread with a prominent side knob that works well in everything but peanut butter mud. The new 700x38c Ritchey Megabite WCS tire. It’s a modernized version of the 700x38c Ritchey Mount Cross tire, shedding its skinwall sidewalls for a tubeless-ready casing. It retains the same 38mm volume, and nearly identical tread. The newer Megabite tread is a bit more open, with shorter 2.5mm knobs, compared to the 3.2mm knobs measured on a NOS Mount Cross tire. The newer Megabite center knobs have a bit of a relief cut into them as well. Both the shorter knobs and divots were incorporated for weight savings. Take an old Ritchey Mount Cross 38c tire (bottom), add a tubeless casing and black sidewall, and you’ve got the new Ritchey Megabite 38c Cross Tire (Top). While the tire marks a return of the Mount Cross tire, it’s also a return of the Megabite Overdrive mountain bike tread. 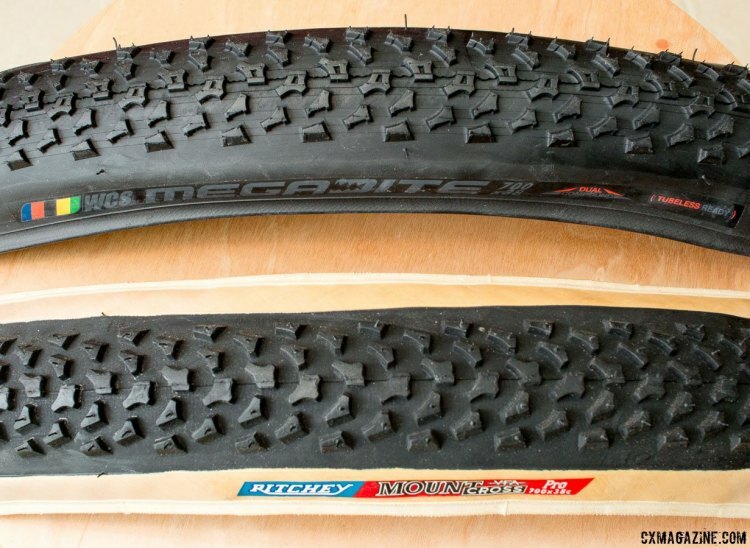 The Megabite Overdrive was one of the early directional mountain bike tread tires, and won plenty of races under Ritchey-sponsored mountain bike racers. 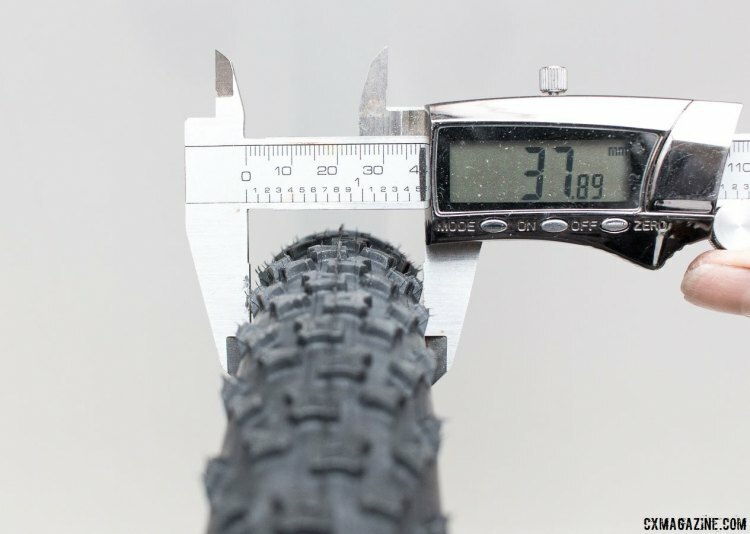 The 700x38c Megabite tips our scales at 442 grams, not ultralight for a cyclocross tire, but relatively light for a high-volume cyclocross or gravel tire. Surprisingly, it’s only three grams heavier than the original Mount Cross tire. 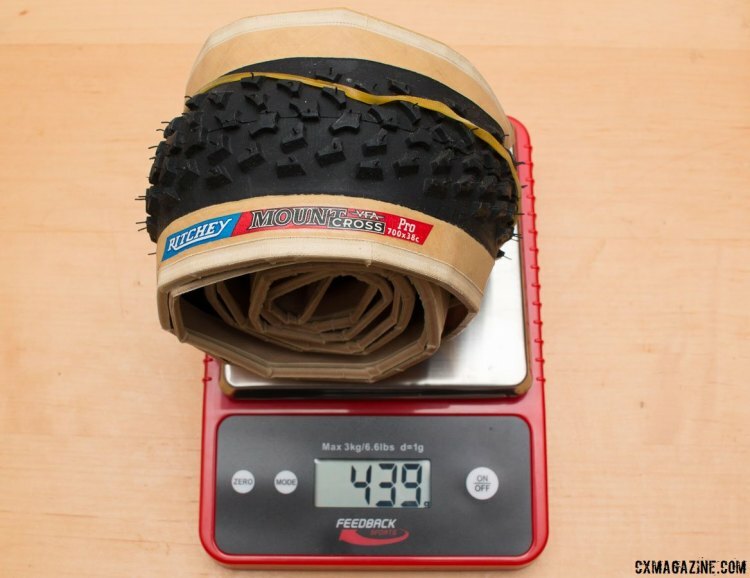 Ritchey Megabite 38c Cross Tire weighs 442g on our scale, just 4g more than the old 38c Mount Cross. 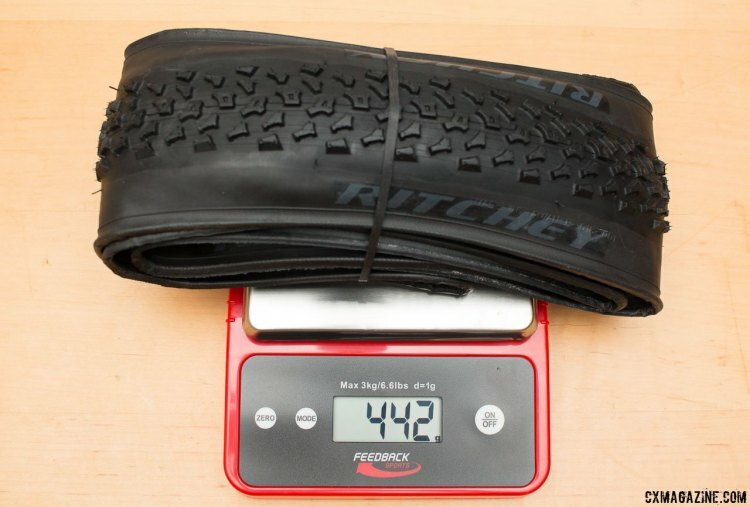 Ritchey’s discontinued 38c Mount Cross tire was of similar weight, tread, and volume. As for the volume, mounted on a 17.5mm internal width rim at 30 psi, the Megabite is close to its listed width, measuring out at 37.89mm on our calipers. That’s within the margin of error of our equipment and my hand. Ritchey Megabite 38c Cross Tire runs pretty true to size, at 30 psi on a 17.5mm internal width rim.